Rosa tells the life story of philosopher, economist, publisher, writer, organizer, political leader, and martyr Rosa Luxemburg, in full-color, graphic form. 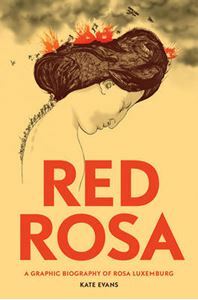 The story follows Rosa from her family life in Jewish Poland, where she became the leader of a general strike at age fifteen and was exiled from her homeland at eighteen, to her immersion into the then largest radical party in the world, the German Social Democratic Party, to her founding of the German Communist Party and leadership of the German revolution of 1919. This beautifully drawn graphic life gives "Red Rosa" her due as an iconic radical, but also portrays a fascinating woman with a rich love life, struggles with physical disability, and an abiding love of literature and theater. Rosa will contribute to the growing understanding of one of the 20th century's greatest revolutionaries.